Swimming is one of the most fun activities for a hot summer day, for people and pets! Just keep in mind that your pets need supervision just like your children. 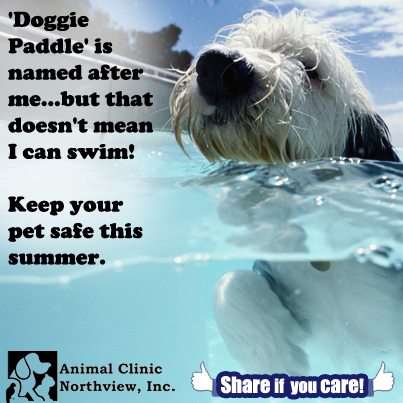 When you can’t be outside with them, keep your pool gates closed and locked to prevent unwanted swimmers from entering the area. Help keep your children and pets, and those who live in your neighborhood, safe! Happy 14 Year Work Anniversary to Judy! The entire team at Animal Clinic Northview would like to thank Judy for the hard work and dedication she has displayed and for the wonderfully compassionate care she continues to show to the pets in our area!